Marriott International (NASDAQ: MAR) today announced findings of its inaugural U.S. Summer Travel Trends Report 2017 based an analysis of nearly 2 million Marriott.com searches and bookings in April and May for travel between the Memorial Day and Labor Day holiday weekends. 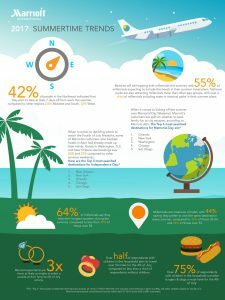 Marriott, which operates more than 6,000 hotels in more than 120 countries, analyzed multiple Marriott-owned data sources including Marriott.com, in addition to surveying more than 2,000 consumers with a proprietary study on their summer travel hacks. When it comes to deciding where to watch the Fourth of July fireworks, some of Marriott’s customers who booked hotels in April had already made up their minds. Hotels in Washington, D.C. and New Orleans, for instance, saw their share of bookings soar 26% and 27%, respectively, compared to other summer weekends. In addition to great All-American summer escapes in the 50 states, Marriott’s report also reveals significant growth outside U.S. borders on holiday weekends compared to other summer weekends. For both Memorial Day weekend and the July 4th weekend, travelers are showing interest in going to the Caribbean and Latin America, with bookings in hotels in Aruba, Puerto Rico, and the U.S. Virgin Islands seeing especially pronounced increases compared to other summer weekends. Marriott sees summer holiday trips growing longer than last year. With July 4falling on a Tuesday this year, Marriott’s bookings for five-day stays are soaring 67% over the 2016 holiday, when the nation’s birthday fell on a Monday. More than a third of customers are booking three-to-five day stays for the Memorial Day and July 4 holidays, according to Marriott’s report. This represents an approximately 70% increase in longer-than-average stays compared to non-holiday summer weekends. Another trend revealed in Marriott’s trend report is strong, continued interest in seeking out summer package deals that include items such as breakfast, parking or Wi-Fi, according to Marriott’s Summer Travel Trend Report 2017. Consumers booked package rates about 7% more often for their holiday weekend vacations than their non-holiday trips. To help consumers explore and experience the excitement in the USA this summer, a wide range of destinations and activities are profiled with the best rates this summer here: from New York, with food tours throughout the five boroughs, to New Orleans’ culture and Dixieland Jazz.